The Toros (Taurus) Mountains paralleling Turkey’s southern border, and the Black Sea Mountains in the north meet to form a mighty range which defines the country’s eastern border. The tremendous diversity of the eastern and southeastern lands surprises travellers: the red ochre plateau of Erzurum; the forests, waterfalls, and green pastures of Kars and Agri; the permanent snow-cap on biblical Mount Agri (Ararat); and the immense Lake Van with its deep blue waters. Dwellings and ways of life also vary greatly in this large region. For example, small, earth-roofed houses, built close to the ground typify Kars. Despite a generally austere life, the people of Kars are generous and hospitable. The region’s long and turbulent history has left monuments to its various civilisations: Byzantine monasteries and churches, Seljuk mausoleums and caravanserais and elegant Ottoman mosques and hilltop citadels. To the inveterate traveller and lover of adventure, this region of Turkey fascinates, astonishes and informs. The great trans-Anatolian axis road, is the most direct route between Ankara and the Iranian border, and passes through Sivas, Erzincan, Erzurum, Agri and Dogubayazit. Erzincan, the principal city of its province, lies 688 km east of Ankara on a fertile plain. The highly-decorated and hand-fashioned copperware of Erzincan maintains a long tradition in the area’s fame for metalwork. 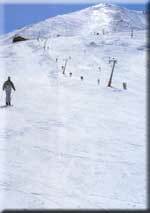 Bolkar, a ski slope 40 km to the west, provides facilities for winter sports enthusiasts. Many of the magnificent bronze objects in the Museum of Anatolian Civilisations in Ankara were found at the nearby Uranian site of Altintepe, east of Erzincan. At Tercan, the round 12th-century mausoleum of Mama Hatun with its beautifully carved stone portal is worth a detour off the main road. The waterfalls at Girvelik, in the same southeasterly direction, provide ideal picnic spots where you can eat a packed lunch and relax to the sound of water tumbling over rocks. Southwest of Erzincan is the beautiful green town of Kemaliye on the Firat (Euphrates) River. The hospitality of the locals and the architecture of the town are worth a visit. The best place for rafting and canoeing is at nearby Karanlik Bogaz. You will also want to go on a photo safari to take in the natural beauty of the area. Erzurum, 193 km east of Erzincan and the largest city in eastern Anatolia, sprawls on a high plateau at an altitude of 1,950 meters. As you enter the city, the large Aziziye monument commemorating the Turkish-Russian war will catch your eye. Although the collection in the archaeological museum reveals much of the city’s history and ancient origins, it is Erzurum’s architecture which is in fact the best picture of its past. The city walls and fortress are reminiscent of the period of Byzantine rule. 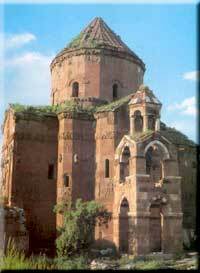 Of particular importance are the remaining Seljuk buildings – brilliant examples of a fascinating aesthetic. The Ulu Mosque, built in 1179, has an unusual form with seven wide naves. The Çifte Minareli Medrese, or theological college built by the Seljuk Sultan Alaeddin Keykubat in 1253, astonishes with elaborate stone carvings on its portal and its majestic double minarets. Behind the Çifte Minareli Medrese stands the Üç Kümbetler, a group of three tombs, the most notable of which is that of Emir Saltuk. The 13th century Hatuniye Türbesi, or mausoleum, was built for Sultan Alaeddin Keykubat’s daughter. The beautiful portal and richly-tiled minaret of the 13th-century, Yakutiye Medrese reveal another facet of Seljuk architecture. You can also see Ottoman buildings in Erzurum. 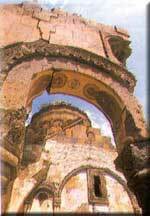 The great architect Sinan left his mark on the city in the Lala Mustafa Pasa Mosque. Kars (212 km northeast of Erzurum) stands at an altitude of 1,750 meters and has played an important role in Turkish history. It was at the center of the Turko-Russian War. The Russian legacy can still be seen in much of the town’s architecture. The lower city unfolds at the foot of an impressive Seljuk fortress from the 12th century. Nearby, the Havariler Museum (the 10th century Church of the Apostles) reveals a curious mixture of architectural influences. Bas-reliefs representing the twelve apostles in rather stiff and primitive poses, ring the exterior drum of the dome. The Archaeological Museum houses beautiful wood carvings, an excellent collection of coins found in the surrounding region, as well as many ethnographic items relating to eastern Turkey. Kars is particularly known for its distinctive kilims and carpets, and it retains a strong heritage of folkdancing. Visitors always seem to enjoy this traditional entertainment. On the mountain pastures, villagers produce excellent Kasar cheese and delicious honey. About 42 kilometres east of the city on the ancient Silk Road, the medieval Armenian capital of Ani (Ocakli) lies mostly in ruins. Impressive fortified walls still encircle the ruins of numerous churches, mosques and caravanserais. The extent to which the large churches are still standing after a thousand years will amaze you. Sarikamis (53 km southwest of Kars) is a ski center with resort hotels set in a scenic pine forest. The Kür River divides Ardahan in the samenamed province (83 km from Kars) and separates the ancient pan on one side from the new city on the other. A 16th-century castle built by Sultan Selim the Grim, one of the most stately citadels in Turkey with 14 towers and a span of 745 meters, stands in the old pan of the city. To the north of Ardahan via Posof lies the Türkgözü bordergate which is now open for travel to the republic of Georgia. Çildir takes its name from the nearby lake which lies at an altitude of 1,965 meters. The scenic area around the lake provides a habitat for a fascinating variety of birds. In the lake, the manmade Akçakale Island was reputedly constructed with the labour of thousands; a temple with Urartian inscriptions remains. Seytan (Devil’s) Castle is near Çildir. The city of Igdir in the samenamed province stands on a large, fertile plain where fruit and, unusual for this geographical region, cotton grow. The Bible relates that when the flood waters receded, Noah and his family descended from Mt. Agri (Ararat) toward the fertile plain. From here, their progeny most likely settled to the south and west along the Firat (Euphrates) and Dicle (Tigris) rivers, establishing the second generation of mankind. From this plain, you have the best view of Mount Agri. Monuments to visit near the city include Uranian rock monuments, a 13th century Seljuk caravanserai and the Karakale (Black Castle). In Karakoyun Village, on the road between Igdir and Aralik, stop at the impressive 15th century cemeteries with Karakoyun (ram and ewe) monumental tombstones. Agri, a provincial capital on a 1,650-meter-high plateau, takes its name from the mountain which looms over it . The pleasant Balik (Fish) lake to the northeast, not surprisingly has plenty of fish restaurants serving local delicacies. Thermal springs bubble up all over the area. For those who want hardy outdoor events, a visit the Bubi Dagi Ski Center, 20 km southwest of Agri, will provide a few days of snow sports. Do not miss the spectacular Ishak Pasa Palace, only 6 km from Dogubayazit. Ishak Pasa, Ottoman governor of the province, constructed the palace in the 17th century with a mixture of architectural styles. Nearby you can see a bas-relief of an Urartian king, and a rock tomb from the ninth century B.C. Near Dogubayazit, Turkey’s most scenic natural monument, Mt. Agri rises to a height of 5,137 meters. To see the place where it is believed that Noah’s Ark came aground, you can begin your trek at Üzengili village, 25 km east of Dogubayazit. Be sure to try the local dessert, asure (Noah’s Pudding), believed to have first been made by Noah’s wife from the last bits of food in the ark. The most direct route to this region is the Central Anatolian Highway that passes through Kayseri, Malatya, Elazig, Bingöl, Mus, Van and on to Iran, via Hakkari. Malatya is a busy city situated on a fertile plain at the foot of the Anti-Taurus Mountains. The Archaeology Museum houses new finds from the Lower Firat region that date from the Neolithic and Chalcolithic ages. Next to the city museum, you can shop in at the bazaar where an entire passageway of shops is devoted to copperware. In Malatya, the apricot growing center of Turkey, it is possible to sample many delicious apricot confections as well as other fresh and dried fruit. The two small towns which pre-date the establishment of present-day Malatya are easy expeditions. Aslantepe, 7 km away, was the capital of a Hittite state in the first millennium B.C., and Battalgazi, 9 km away, was once the ancient city of Melitene. At the latter, stand the ruins of a Byzantine enclosure, and in the center of town, the 13th-century Ulu Mosque is an excellent example of Seljuk architecture. Elazig, founded in the 19th century, lies on a plain in the shadow of a mountain crowned with the ancient citadel of Harput. Destruction wrought by several earthquakes and the relatively recent construction of Elazig has led to most of the population of Harput deserting it for the modern city. Several Seljuk mosques remain, however, which are worth visiting. The Keban and Karakaya Dams on the Firat river have created huge artificial lakes, dramatically altering the surrounding environment. Twenty-five kilometres south of Elazig, the lovely and tranquil Hazar Lake invites relaxation. High mountains encircle Tunceli, 133 km north of Elazig on the Elazig-Erzurum road. On the way, stop off to see the fortress of Pertek, built in the Middle Ages and still in good condition today. In the Munzur Valley National Park near Ovacik, 60 km northwest of Tunceli, you can fish in rushing, trout-filled streams while enjoying the amazing scenery. The name of Bingöl means “a thousand lakes”, a name given to it because of the many glacier lakes in the surrounding mountains. In the city stand the remains of a medieval fortress. Bingöl-Yolçati (Kurucadag) Ski Center is 20 km to the west. Mus, a little out of the way for most tourist expeditions, was founded in the sixth century. Many of the city’s monuments, including the remains of a citadel and the Aslanhane Caravanserai, are in poor condition. The Seljuk mosques of Alaeddin Pasa and Haci Seref, however, are certainly worth a detour. Korkuteli is famous for its kilim weaving and Siirt blankets; it is definitely worth seeing. The lively city of Bitlis, an important center of tobacco production, stands in the middle of a green oasis. The city’s architecture uses the local dark stone, and the stone monuments include the Serefhan Medrese, the 12th-century Ulu Mosque, the Seljuk Gökmeydani Mosque and the Ottoman Serefiye Mosque. Bitlis Sapgõr Ski Center is close to the town’s center. From Tatvan on the western shore of Lake Van, you can take a passenger and train ferry across the water to Van. Nemrut Dagi (Mt. Nemrut, not to be confused with Nemrut Dagi National Park in the province of Adiyaman) makes a challenging climb. In its center a deep crater lake bubbles with volcanic hot springs. The ruins of Ahlat are 44 km north of Tatvan on the western shore of Lake Van. The ruins of this once-important city of Turkish art and culture are scattered today among more recent constructions. In the 12th century this city was the capital of the Turkish state that ruled the Van Basin. Several mausoleums, notably the Ulu Kümbet, the Bayindir Kümbet, the Hasan Pasa Kümbet and the Çifte Kümbet offer a comprehensive overview of Seljuk funerary architecture and decoration. In the Seljuk cemetry are beautifully inscribed memorial tombstones from the 12th century. The Turkish Art Museum houses a collection of ceramics, ancient coins and jewellery. Modern Ahlat provides lakeside tourist accommodation, beach facilities and restaurants. As you drive on around the lake you come to Adilcevaz, where the Ulu Mosque, built of the region’s dark volcanic stone, stands on the lake shore. Ten kilometres west of Adilcevaz is Kef Castle, and the nearby Urartian temple of Haldi dates from the ninth century B.C. Artifacts from this site can be seen in the Museum of Anatolian Civilisations in Ankara. The Adilcevaz High School yard displays some of the column bases. Van (170 km east of Bitlis), the ancient Urartian capital of Tuspa, tempts visitors with its location on the eastern shore of the lake. This remote but important city is set in a verdant oasis at the foot of a rocky peak. An imposing 9th-century B.C. citadel overlooks the new and the old parts of town. Steps carved in the rock lead to the Urartian fortress. Halfway up the steps, inscriptions in cuneiform pay homage to Xerxes. Within the fortress are several Urartian royal rock tombs. In the old city, the Ulu Mosque, Hüsrev Pasa Mosque, Kaya Çelebi Mosque and the Ikiz Kümbet reflect Seljuk and Ottoman architectural styles. Van’s interesting Archaeological Museum is in the new city, inland from the uninhabited old district. Still very much part of a traditional lifestyle, the women of Van produce beautiful kilims woven in blue, red and white patterns. The exotic Van cat, a protected specie, has thick white fur and one blue and one green eye. At Van Iskelesi (Van Harbour), friendly tea gardens and restaurants invite you for a break. Edremit, a holiday resort center 14 km to the southwest, has good beaches, swimming and camping. In the same direction is Gevas, where you can visit a Seljuk cemetery with numerous decorated headstones, and the lovely Halime Hatun Mausoleum. Lake Van, the largest lake in Turkey is at an altitude of 1,720 meters, and is ringed by beautiful mountains. Mt. Süphan (4,058 meters) is on the northwest side and the Ihtiyar Sahap Mountains is to the south. You can circle the lake, visiting several ancient Uranian sites as well as other places that represent the legacies of the various peoples who inhabited the area. 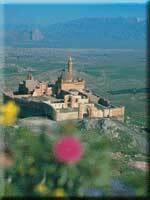 Some of the islands in Lake Van have monasteries and churches built on them. No doubt the remote location offered seclusion to the resident religious communities. Forty-one kilometres southwest of Van, Akdamar Island (a half-hour sail from shore) is the most important of these. On the island stands the 10th century Church of the Holy Cross, now a museum, whose stone walls are richly carved with Old Testament scenes and figures. After sightseeing, swimmers and picnickers can enjoy themselves around the island’s almond groves. If you have time, also visit Çarpanak Island to enjoy its landscape and to wander around the 12th-century church, which has now been converted into a museum. Çavustepe, 35 km from Van on the Hakkari road, is an important Uranian citadel. Excavated in 1970, today you can see temples, a palace, a sacrificial altar and inscriptions. On the pastoral, winding road to Hakkari, the Zernek Dam Lake offers itself as a resting spot on the way to Hosap, 60 km from Van, where a 17th-century fairytale castle rises above a small hill. Although the interior is badly damaged, the exterior walls, crenellations and turrets are well-preserved. Among the interesting geographical features around Lake Van, the Muradiye Waterfalls, 88 km north of Van, with a peaceful tea garden and restaurants, and Gahnispi-Beyaz Çesme Falls, 60 km south of Van, are worth visiting. The road to remote Hakkari, 203 km southeast of Van, takes you through some of Turkey’s most magnificent scenery: the Cilo-Sat Mountains and the Zap Valley. A medieval fortress dominates the city, which is at an altitude of 1,748 meters.